One week after even the IMF joined the chorus of warnings sounding the alarm over the unconstrained, unregulated growth of leveraged loans, and which as of November included the Fed, BIS, JPMorgan, Guggenheim, Jeff Gundlach, Howard Marks and countless others, it appears that investors have finally also joined the bandwagon and are now fleeing an ETF tracking an index of low-grade debt as credit spreads blow out and cracks appear across virtually all credit products. 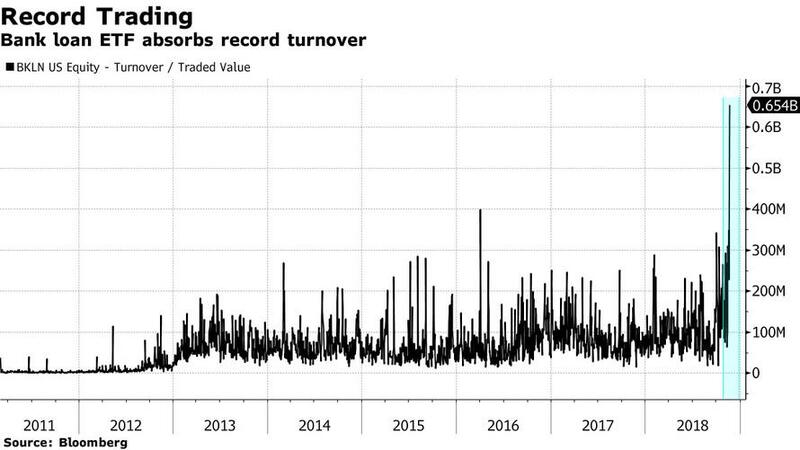 Not only has the $6.4 billion BKLN Senior Loan ETF seen seven straight days of outflows, with investors pulling $129 million on Wednesday alone and reducing the fund’s assets by 2% to the lowest level in more than two years, but over 800 million has been pulled in last current month, the biggest monthly outflow ever as investors are packing it in. Year to date, the shares of the largest ETF backed by the risky debt are down 1.7% and reached their lowest since April 2016; the ETF's underlying benchmark, the S&P/LSTA Leveraged Loan Index, has also been hit recently and is down 0.6% YTD. What is more concerning is that what has been a mere trickle of selling appears to be evolving into a full blown liquidation: some 29 million shares of BKLN, worth $654 million, traded on Tuesday - mostly on the downside - resulting in a record trading day for the fund and more than eight times its average daily turnover for the past five years. Speaking to Bloomberg, Yannis Couletsis, principal at Credence Capital Management said that "outflows for BKLN have most probably to do with the most recent deterioration of the credit environment,"; he ascribed the ETF’s drift on the deterioration of low-grade credit and "repricing of investors’ forecast regarding the path of Federal Reserve’s interest rate hikes." Couletsis pointed to widening credit spreads and the fact that BKLN has floating-rate underlying instruments, assets that become less attractive than fixed-rate ones should the Fed skip its March rate hike, as some are anticipating. The loan ETF puke comes at a time when both US investment grade and junk bond spreads have blown out this week the most in nearly two years, while yields spiked to a 30-month high this month. In fact, investment grade bonds are on track for their worst year in terms of total returns since 2008. BLKN isn't alone: investors have pulled $1.5 billion from loan funds since mid-October. According to a note from Citi strategists Michael Anderson and Philip Dobrinov, leveraged loans in the U.S. may no longer be the “star performer” amid a potential pause in rate hikes by the Fed, while the recent redemption scramble has caused ETFs to offload better quality loans to raise cash, according to the Citi duo. That’s despite leveraged loan issuance being at its highest since 2008 and returns on the S&P/LSTA Leveraged Loan Index at about 3.5 percent so far this year. Incidentally the behavior described by Citi's strategists, in which ETF administrators first sell high quality paper then shift to deep discount holdings, was one of the catalysts that hedge fund manager Adam Schwartz listed three weeks ago as a necessary condition for credit ETFs to enter a "death spiral." And with virtually everyone - including the Fed, BIS and IMF - all warning that the next crisis will begin in the leverage loan sector, the question to ask is "has it begun. "?